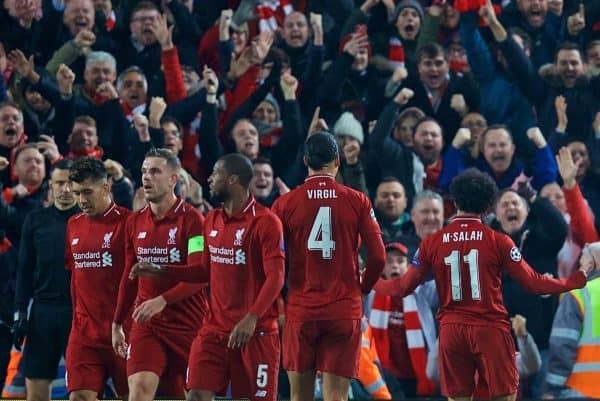 Liverpool secured a dramatic 1-0 victory over Napoli in the Champions League at Anfield to clinch their place in the last 16. Many permutations were possible in the centre of the park, but Jurgen Klopp opted once more for the tried and trusted, though that’s not to say proven, trio: Gini Wijnaldum, Jordan Henderson, James Milner. It was a triumvirate which didn’t inspire a huge amount of pre-game positivity, based on their performances this season, but the first half showed a key difference. It was first visible from Wijnaldum, then Milner: forward runs, all the way into the penalty area and offering a real option in the final third. 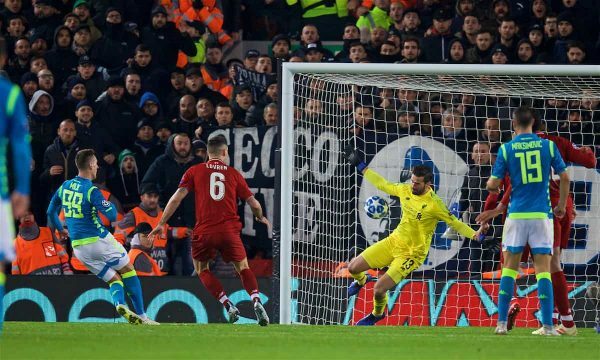 Milner curled an effort wide in the second half, Wijnaldum got the fans signing with powerful surges forward as the game wore on and the tension increased, and even Henderson went close with a drilled half-volley. A much more impressive performance as a trio, justifying Klopp’s initial selection, even if there were a few gaps in the deepest area of the pitch at times. Milner’s standing ovation as he left the field was completely warranted and Henderson’s second-half display was comfortably his finest of the season. 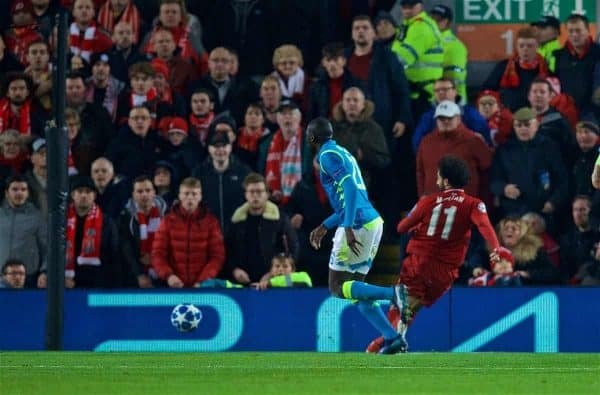 If one good chance was going to fall to the Reds, most fans would have wanted it to fall to Salah. In the end he did most of the hard work himself to create the chance, though a helping hand—or pair of despairing, over-anticipating legs, more to the point—from David Ospina certainly played a part. After a weekend hat-trick, Salah is very much back in form for the Reds and he was central to much of the good attacking play during the 90 minutes. He might have scored another himself after rounding Ospina, but he also helped create chances for Mane and Wijnaldum. A very good outlet down the right, a creative force—and, crucially, the match-winner. 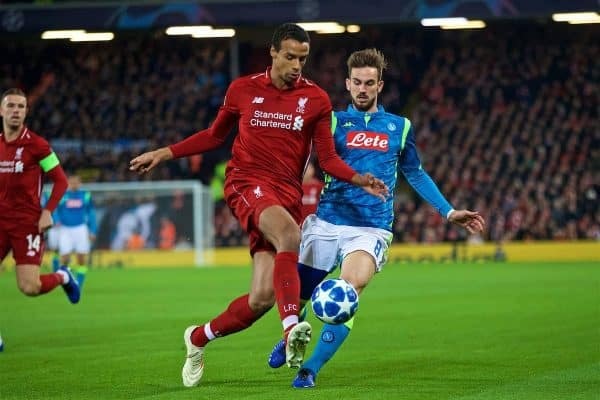 For the third match in succession, Joel Matip put in a masterful performance for the Reds. He was, until a month ago, comfortably the fourth-choice centre-back for Klopp; Joe Gomez‘s injury and Dejan Lovren‘s altogether inconsistent season, in terms of availability, has changed all that. To his credit, Matip still had to take the chance afforded to him—just as Gomez did in the summer—and he has been excellent in doing so. His passing was aggressive and forward-thinking, he wasn’t afraid to run forward into space and, most importantly, the Cameroonian’s defensive work was on-point. 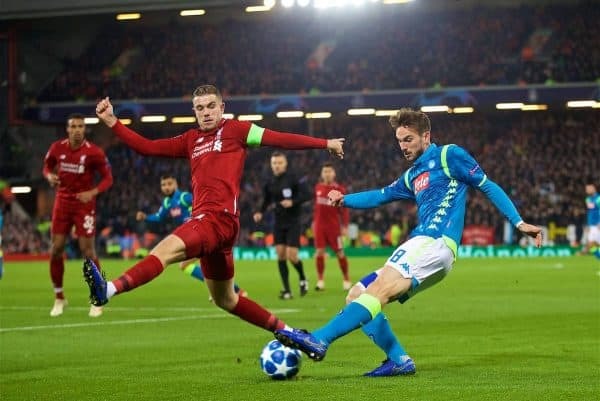 A big nod of appreciation, too to the entire back four—but Robertson was a particular stand-out in both halves of the pitch. Eidur Gudjohnsen: Arkadiusz Milik. This was the 2018 version of that heart-stopping moment in 2005, albeit not as far on in the tournament. 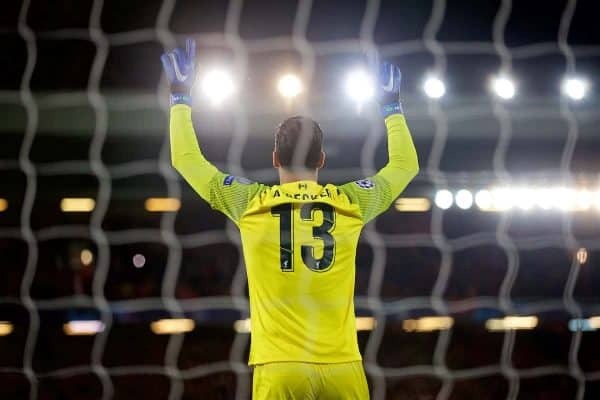 One chance, one second, one season hanging in the balance—and Alisson Becker came up with yet another match-saving moment of his own, throwing himself in the way of Milik’s shot and making a crucial late save. Right there and then, and hardly for the first time, he proved his worth as (briefly) a world record signing for a goalkeeper. The Reds are in the last 16 thanks to him. Europe in 2019: Champions League it is! We didn’t want to wake up on Wednesday in the Europa League, to paraphrase a former Liverpool captain. And we won’t—it’s the last 16 for Klopp and his men, with second place assured thanks to the better head-to-head against Napoli. As has proven to be the case in the not-too-distant past, once into that knock-out phase anything can happen; few teams will relish coming to Anfield and not many managers can outwit Klopp over two legs. There remain big challenges ahead, but Liverpool can face them without fear. And, of course, it’s Manchester United next up, as the Reds bid to reaffirm their grip on first place in the Premier League.